So Turn the Page Artists book fair has been and gone and in between the rest of life and work I can assure you I’m getting together all the bits and bobs I need to finish the books I promised to post out to new homes. It was a lovely weekend by all accounts. The sun alternately warmed and dazzled us through the glass ceiling as we circled, sat and wondered at the variety and splendour of the artists book / book arts field. The central showcases worked well to display the more sculptural works, enticing people into the space, diverting the flows of movement around the tables and breaking the stiff-neck-close-focus-rictus even the best book fair adventurers must suffer from. I got to meet some lovely people, generous with their advice, tales and praise but am ashamed to say that as usual I didn’t get to see all the people and work I’d have liked. From those artists I did manage to speak with Gloria Ceballos‘ wild flower work, Theresa Easton’s colourful books full of social and science history and Stef Mitchell’s caravan printing adventures all inspired. The frozen Lake Baikal has an ice road with actual road signs that is used daily between the freeze and the thaw. The road is replaced by hovercraft when it becomes unstable and a ferryboat in the summer. 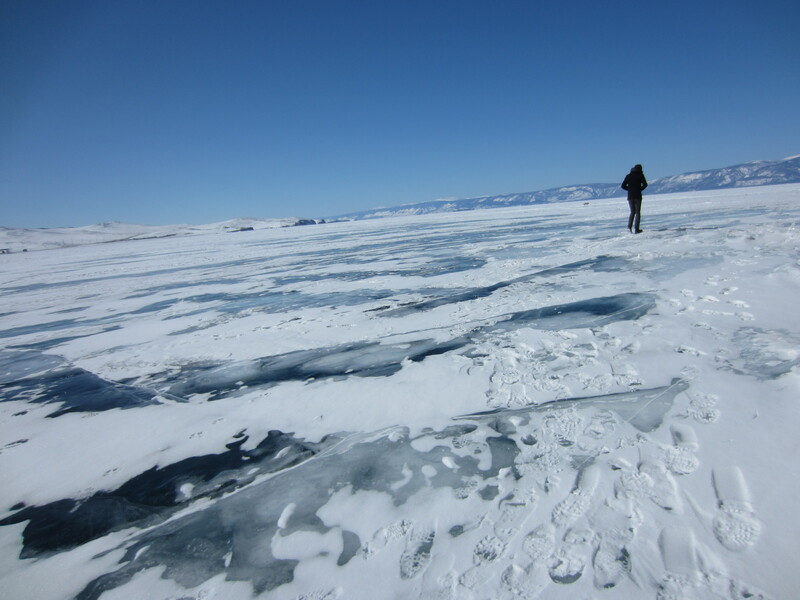 We got to drive over this twice on our way to and from Olkhon Island late March. At times the van’s wheels spun and the driver moved off the road and back again while we held our breath, but of course it was perfectly safe, they have been driving the lake for years. From afar the water seems frozen mid-wave; in the shallows it looks like shallow waves, further out it looks like deep water, perfectly normal, except it’s frozen. If anyone can explain this to me please try. Here are some close ups of the ice I took while walking around the edges of the lake near Khuzir.